Originally from Turkey, tulips were actually used as currency in the Netherlands during the Middle-Ages. Today, tulips hold high value for beauty and color within the “currency” of top florists. But for design pros, acquiring the right tulip for the right job at the right time of year can be tricky. From January to May, floral businesses across the country include tulips as a staple of their everyday creations. Because there are so many options and considerations, however, it’s easy to miss opportunities (even in the off-season.) Here’s a quick breakdown of the 5 most important considerations when planning your wholesale tulip buying. in horticulture, the rules have been blurred to your advantage. Classic French tulips, for example, have changed a lot in the last 5 years. With the release of the “Pride Series” from Holland, you can now find Classic French in more vibrant reds, oranges, yellows and bi-colors (not just pastels.) Some varieties of French tulips now have heads the size of a coffee cup! The better grade of bulb a grower uses, the better the tulip. Naturally, this affects the price. Other price factors include domestic growers importing bulbs, and how they nurture them in ways to extend availability throughout the year. Whether you’re buying domestically or importing from Holland, look for improved quality with top-grade bulbs. Tulip bulbs from the Southern Hemisphere (like New Zealand, for example) are often imported by American growers during late fall. This practice provides Spring-like quality tulips during the early part of winter. These same domestic growers also need to pay for the proper conditions to maintain these bulbs. Optimum soil treatment, temperature control, and processing practices for world-class tulips all come at a price, but the results are well worth it! Typically, there is limited fall production from reliable, strong growers (October through December.) But, as we mentioned, top growers are quickly advancing the market’s capabilities. Because seasons have gotten longer, variety and selection continually improves. It never hurts to check on availability, even when you think a certain variety should be off-crop. 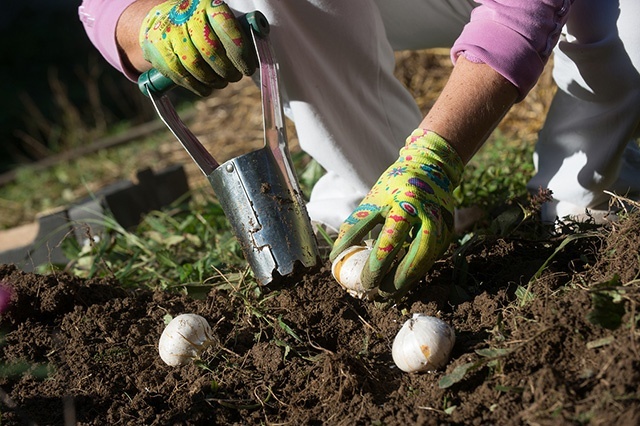 Reputable domestic tulip farms know which bulbs to import for the off-season, when to bring them in, and how to “trick” the bulbs during times of the year when they otherwise wouldn’t grow. Your wholesaler’s relationship with these advanced growers is critical in ensuring that you have the widest tulip selection available for longer periods of time. Holland, the world hub for tulip production, also offers premium varieties for both the on and off-season. Some wholesalers are able to plug their customers directly into the Dutch Auction online using exclusive e-shopping carts like Holland Order Xpress. This is also an easy, convenient way to assess which tulips are available directly from Holland during any given time period. Leaf color is the primary indicator of quality. Dark green foliage around the flower portends a dramatically extended shelf and vase life. On the other hand, light green, pale or slightly yellowing foliage signals the opposite. Other factors include bloom size and stem strength, both of which are indicators of a well-hydrated tulip. Parrot Tulips: Deeply feathered, curled or twisted petals with vibrant coloring. These are some of the longer-lasting tulips, with usually 2-3 colors per bloom. 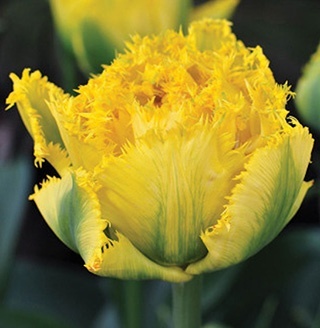 Golden Gate Tulips: Bright yellow with a fringed bloom around the edges, Golden Gate tulips provide the brilliant pop of color and texture that sets it apart from its more traditional counterparts. 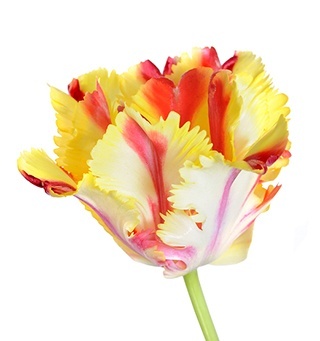 Rembrandt Tulips: Textured markings and multiple color tones set Rembrandt tulips apart. Fun Fact: Their unusual markings were actually caused by a virus. 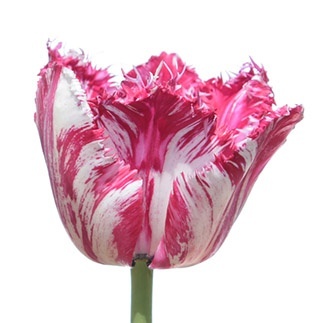 Several modern, virus-free Rembrandt tulips are grown with bold and extravagant streaking. Don’t be afraid to mix fancier tulips in with your everyday designs. Your customer will notice, and your brand will reap the rewards of thinking outside the box.